"Go on, tell them," says Jacko to Sean. "Tell them what? I'll tell them nothing. They're not people like us, they're just a bunch of sardines." The fish people in the water below do not like this. "You heard me," jeers Sean, "Cold-blooded fishes. You haven't got a drop of good red blood in your body." "A flatfish from Galway would have more guts in them than that bunch!" Sean continues. Oh yeah, I forgot to say... Sean's Irish, hence his "gift of the gab" (sigh). The fish people start throwing things at him. 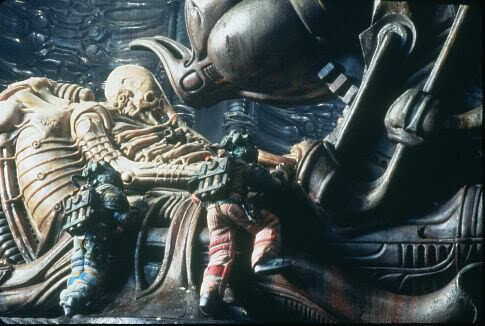 Prometheus tries to evoke the aesthetics of Alien in a way that is borderline obsessive. Even down to making sure there are cream-coloured leathery/cushiony pads on the spaceship corridor walls. Still greater attention is paid to replicating H.R. Giger's design concepts for the derelict alien ship, cockpit and pilot from the original film. The really weird thing is that, even as Prometheus deliberately and slavishly tries to evoke and/or copy the aesthetics of Alien, it completely overlays them with an entirely different, clashing aesthetic sense. Look, why is this image so powerful? There are, I think, a number of reasons.